The first title in an action-packed junior fiction series, Axel & Beast: The Grabbem Getaway centres on a lonely gamer and a robot on the run. When shape-shifting robot Beast bursts into Axel’s room, he is desperate to hide. 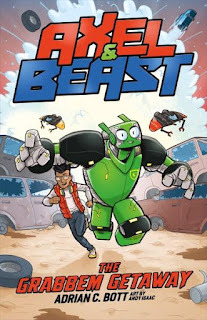 Beast has escaped from the destructive Grabbem Industries, and finds a likely ally in Axel, who’s endured his own encounters with nasty bullies. With the help of insider Agent Omega, Axel and Beast, band together to overcome Grabbem’s evil intentions. Despite its emphasis on technology, gadgets and fast-paced action, the story has a feel-good factor, too. The message of fighting back against corporate greed and environmental destruction is an important one, and is ever-present in Axel & Beast’s fight against Grabbem Industries. There are some fun secondary characters too, notably Rusty Rosie who rules a junkyard – a force to be reckoned with. There’s also Axel’s mum, Nedra, a very capable mechanic hailing from Sri Lanka whose lovely relationship with Axel is quite touching. It would be a shame for this book to only be picked up by (or purchased for) boys, as there’s a universality to the story’s themes that everyone can enjoy. As a footnote, the author’s moniker ‘Adrian C. Bott’ seems too good to be true – it’s perfectly suited to the subject matter!